Supercar gatherings in Monaco are always a welcome sight for the rest of the world. Car spotter Fipeux was in Monaco recently shooting some footage of a stretched, Brabus-tuned Mercedes-Benz G55 AMG when a white and carbon-trim Lamborghini Aventador rolled by. 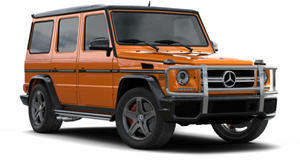 The XXL version of the powerful Brabus G-Wagen has been spotted before, but in combination with the high-contrast Lambo, this is one high-end exotic car showdown sure to leave an impression.